I drove back to Otero County earlier this week to try to refind the Long-billed Curlews I found over the week-end in hopes I could confirm breeding. I did refind them and spent 2 1/2 hours observing, photographing and videotaping them. The top pic shows (from left to right) female,chick, and male. How do I know this? 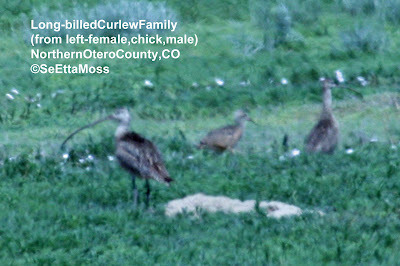 The subscription online reference guide from Cornell School of Ornithology-Birds of North America states that the bill of female Long-billed Curlews is longer than the bill of males (and different shape but I can't discern that as these birds were 250-300 feet away) and that the bill of juveniles is shorter than that of adults during it's "first few months."